According to some recent images posted by accessories manufacturer Olixar and retailer Mobile Fun, the Apple iPhone SE (2018) could feature an edge-to-edge display, a notch, and Face ID. Considering that the first generation version of the phone (released in 2016) had a retro look dating back to the Apple iPhone 5s, this obviously is a big deal. The big question is whether or not the next iPhone SE will truly look like these renders and photographs. 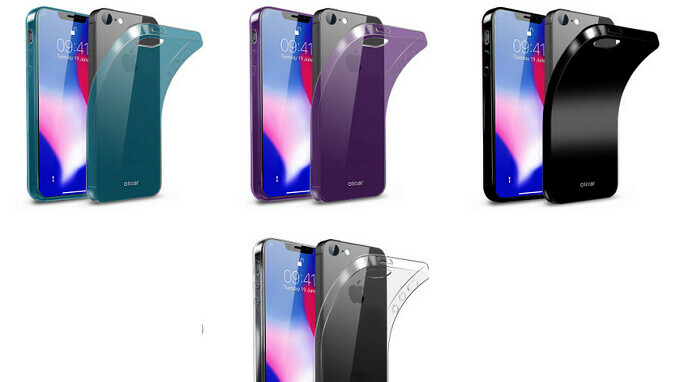 While the renders we showed you were from Olixar's screen protector, the company's first case for the iPhone SE (2018) has now been posted on Mobile Fun's site. The case, priced at $8.23 each, is available in Blue, Purple, Solid Gloss Black and 100% Clear. It is now available for pre-order from Mobile Fun (click on the sourcelink if interested). But the most important detail is that the renders that accompany the listing reveal the back of the device including the single camera on back, and the flash. The iPhone SE (2018) is believed to carry a glass back (hence the importance of buying a case to protect it), and based on these renders it would appear that the camera lens will be larger than the one found on the OG model. The Apple iPhone SE (2018) could the lowest priced phone that Apple releases this year. As such, it is key to its strategy in developing markets like India. The latter is the second largest smartphone market in the world, but a low per-capita income makes consumers in the country super-sensitive to pricing. Apple had been producing some iPhone SE units in India to help it conform to the country's "Make in India" initiative. There are reports that Apple plans to continue this with the iPhone SE (2018). Don’t worry, iOS has great battery management baked right into the software. I've been waiting for 7 years. Still using the S4 mini for Android since all of the Xperia compacts have s**tty cameras. I love my Small iPhones. Android manufactures have to catch up with Apple in making phones with hideous notches? I hope Samsung never "catches up" then. Design is good without a notch but what about software features of ios 12 it's lacking compare to android p.
iOS13 incoming. Android gonna die by this year being incompetent to iOS. But Android was going to die since 2007?? You're delusional if you think that will happen ever. The SE looks like it’s gonna be pretty sweet. For being the entry level iPhone, it’s gonna pack some good tech. Priced right, it looks to be a good buy. The edge to edge screen will make it the first entry level phone priced above $800usd. It might mean wider lenses, not just bigger sensor. The renders are cool, if price right this will boost iPhone sales. Apple will sell a ton of these. i would definitely get it if it looks like that with a right price. current tall Android phones are too big/tall. Sorry you have tiny Trump hands.